Social Security recipients deserve a benefit increase -- but they won't get one on January 1, unless Congress takes action. I support Elizabeth Warren's Seniors And Veterans Emergency (SAVE) Benefits Act, which would give 70 million Americans an emergency benefit increase of about $580 -- that's 3.9% for 2016, the same raise that the big CEOs got last year. Her proposal would also extend the life of Social Security, and would be paid for by closing corporate tax loopholes. This year, gas prices are low and because of the way the government calculates inflation, they're saying there's no need for a Social Security benefit increase. But we know that rent keeps rising. So does the cost of groceries, health care, medicine, and more. Without a cost of living increase, many people on Social Security will struggle to pay their bills. We have to do something about it before January 1. And Elizabeth Warren has an answer: the SAVE Benefits Act. We don't have a lot of time. 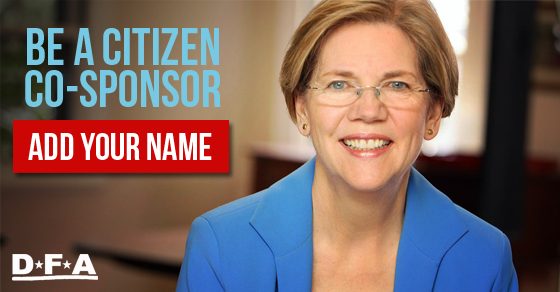 Will you join DFA and help Elizabeth Warren build public support for an emergency boost to Social Security benefits? Add your name and become a citizen co-sponsor of the SAVE Benefits Act!